Hello everyone! Christmas is coming soon, and I wanted to share with you a gift bag I made using Layers of Color Natural Flourish art stencil. I used Tim Holtz Acrylic Dabber in Pearl and it has a wonderful luminescence. I dabbed the paint onto Deja Views designer paper from the Timeless Collection. I then stamped an image from Layers of Color Touch of Elegance clear art stamp set in Not Quite Navy to act as a shadow. I then over-stamped another image from the same stamp set in the TH Pearl paint. 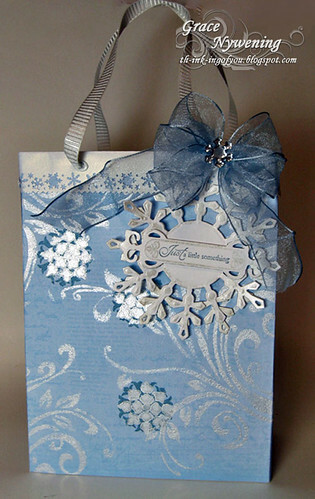 The top of the bag is punched with a MS Snowflake punch from Effects PaperCraft Pad by Canson... it's very opalescent. For my tag I cut a Spellbinder's Snowflake Pendant twice, sponged with Brilliance Platinum Planet Ink and glued together for thickness. I stamped the sentiment from Nina Bracketts set "Fanciful Tags", available from Gina K. I cut it out with the Spellbinders Fancy Tag and adhered it to the snowflake tie on. My handles are stiff ribbed ribbon from Michael's. The ribbon is May Arts to which I added a touch of bling. I used the basic instructions found at Create with Connie & Mary, though I made some changes. This bag is very sturdy with a lining inside that could hold substantial weight. I hope this inspires you to try some different ideas for your Christmas projects. The stencil and the art stamp set are not Christmas, yet stamped in shimmery pearl paint and a few snowflakes added certainly make it work for Christmas! Have fun with it! Thanks for stopping and have a blessed week! Wow, hat bag is just beautiful! Hope to see you real soon. This is just shimmer-licious Grace - a gift in itself!! Wow, super lovely, Grace!! What a treasure! So pretty and so elegant, thanks for playing along with us at CCCB! what a gorgeous gift bag Grace...so pretty. Beautiful DP and the tag is just awesome. Thanks for joining us at Paper Sundaes this week. Really pretty love the colour & the shimmer looks fab!! What a wonderful bag Grace. Very pretty! Thanks for playing along with LRW! I think this is beautiful. I love how the color shines so beautifully. I bet it would be wonderful for an icy lake with a full moon in the winter! I LOVE those swirls...and your snowflakes are just wonderful. The bow and the tag pull it all together so nicely. So elegant Grace. Please put me on your gift list. LOL! Thank you for joining us at the Simon Says Stamp & Show Challenge! Thanks for joining us at the SCSC & Pile It On! Very pretty! Thanks for playing along at Paper Sundaes! Beautifully done. I love how you showed the wonderful flexibility of Layers of Color! I've never tried the daubers. Do your tips ever dry up or clog up?? That's the reason I had hesitated in trying them. Did you use stencil adhesive with this project?? Thanks for all of your lovely inspiration! A beautiful bag Grace, lots of work but well worth it, the end result is stunning. Thanks for sharing with us at Let's Ink It Up. Beautiful gift bag! Thanks for joining us at Craft Your Passion. This is so pretty.. Thanks so much for playing along with us at CCCB! This is so pretty! I love the blue and the snowflakes! Thanks for playing with us at Going Grey with Scrap-Creations. This is soooooo lovely!! Thank you so much for playing along at CCCB this week! Beautiful creation, and thank you for sharing at LIIU. Thanks for joining us at CCC this time, and good luck! And... Thank you for joining at LIIU this time!! !